When he was a young man, Combat Flip Flops founder Matt Griffin wanted to change the World for the better, and improve the lives of ordinary people. It was with that aim in mind that he served in the 2nd Ranger Battalion after graduating from the United Stated Military Academy in 2001. Matt went on to serve four tours of duty, in both Iraq and Afghanistan, between 2003 and 2005. He participated in more than 100 special operations missions during his time in active duty before finally leaving the military in 2006. Matt went on to work in the defense sector, and that led him back to Afghanistan. There he witnessed the positive influence of economic growth, particularly in regions devastated by warfare, and he was inspired to start a business that brought employment, and greater stability, to the people living desperate lives in dangerous places. He teamed up with friend and fellow former ranger, Donald Lee, commonly known as Lee, and together they arranged for products, outsourced to factories and individuals in dangerous areas, to be sold in America. The benefits to the workers would be immense. A regular income would create a better life for them personally, but it would also see improvements to those areas, as greater employment and economic stability brought its own peace. Matt gave a talk about his story, and the mission of Combat Flip Flops in a TEDx event in mid 2015, but more action would be needed to spread the word about the business that could help so many. Matt and Lee had both been working part time jobs as the business got started, but they required investment to concentrate on Combat full time, and to that end they appeared on Shark Tank in February 2016. 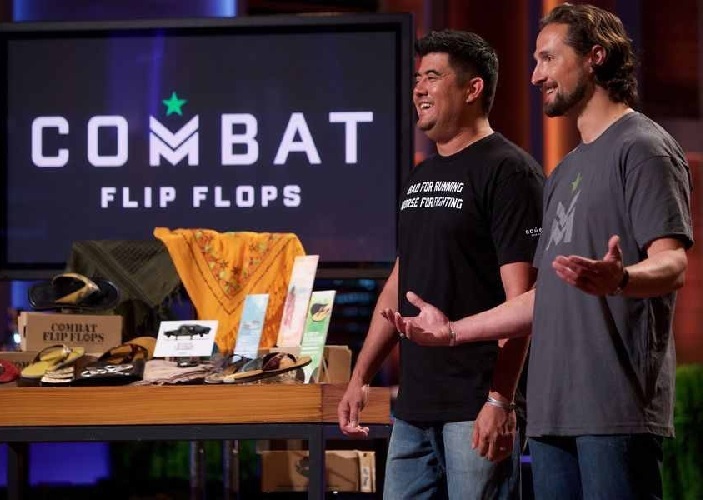 When Matt and Lee appeared on the show they were looking for a $150,000 investment, in exchange for 10% equity in the Combat Flip Flop business. After entering the tank they quickly launched into their pitch. 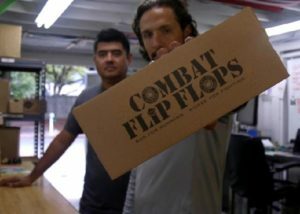 They explained the unique and special mission behind Combat Flip Flops and the work they created for people in war ravaged regions. The flip flops were made in Bogotá, ‘We support craftsmen, not Cartels’ explained Matt. The sarongs, belts and scarves were made in Afghanistan, by women who would be destitute otherwise, Combat also produced Jewellery, in collaboration with a mine clearance charity. The raw materials for the jewellery were supplied from land mines that had previously been cleared. Matt told the sharks ‘You probably think we’re crazy’, he continued with ‘and you’re right’. Kevin O’Leary laughed, but Matt had a serious point to make. He knew the sharks had probably been told they were crazy in the past, and it hadn’t stopped them. He asserted that businesses were more powerful than bullets, and urged the sharks to enlist in the Combat Flip Flop business. Then came the ever popular free samples for the sharks. Robert Herjavec got a pair of the AK47 Flip flops, the best selling item in the combat range, ‘They’re very comfortable’ he commented. Daymond John agreed wholeheartedly, ‘These are beautifully made’ he remarked, high praise indeed from the fashion guru. Mark Cuban asked about the entrepreneurs backgrounds, Lee explained that they had both served multiple tours, in both Afghanistan and Iraq, and had met during that time. They had a mutual wish to help the people in the areas they had been stationed to, and had talked about starting a business to achieve that at the time, things had grown from there. Kevin O’Leary, as always, wanted to know about the numbers, he asked about the cost of the AK47’s. Matt informed him the cost to manufacture them was $20, and there was an additional $5 cost to transport them to the United States via air. Lori Greiner was curious why products were being air-shipped in. Matt explained that the company could not keep up with demand, for the past three years the business had been selling its stock as soon as it was received. He continued and revealed the retail price was $70. It was a good profit margin, and Daymond looked interested. 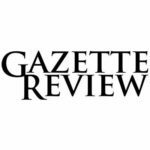 He inquired where the sales were taking place, Matt disclosed that 89% of business was through online sales at the moment, with the remainder going to wholesalers. Robert asked what the sales had been so far and Matt confirmed that in the previous year they had achieved $137,000 in sales. In the current year they had already exceeded that figure, and they were confident that they would make total sales of $300,000 by the end of the financial year. Daymond John was experienced when it came to operating manufacturing facilities in foreign countries, he was aware that sometimes it took a while to learn about problems specific to that location, he was also concerned that the Combat business wasn’t going to be easy to scale up. Matt was honest in his reply, he admitted that he didn’t know personally how the business could scale up, but the company had experts on hand who could help with that, if they could acquire an investment in the tank. Robert Herjavec had similar concerns, particularly as the company had so many products, ‘You’ve got to go narrow, you’ve got to go deep’ was his opinion. Kevin O’Leary thought the Combat Flip Flop business was a great thing, noble he called it, but he also found the product range too diversified, and was unsure how profitable the business could be. And with that, Kevin was out. Lee and Matt exchanged a quick grin and Lee announced ‘We’ve got something for you, Kevin’, before handing the shark a glow in the dark chem-stick. Kevin asked what it was and Lee explained ‘It’s how we mark the dead’. The sharks loved that, and even Kevin saw the funny side. Robert Herjavec ended the light-hearted moment, he was also just too uncomfortable with the size of the product range, and he joined Kevin in dropping out. ‘Please don’t give me an orange thing’ he urged the entrepreneurs, but it seems they had reserved that honor for Mr Wonderful alone. Things started to improve for Matt and Lee from that point on, Lori expressed an interest in offering a deal, if she could get another shark to partner with her. She looked over to see if Daymond or Mark were interested, but they were deep in a whispered conversation. Mark spoke up when the discussion was complete, he told Matt and Lee that both he and Daymond were 100% behind their core values and their vision for the company, and they were prepared to make a joint offer. They would supply more than the requested investment, two hundred thousand dollars, but in exchange for 25% of the business. Lori wanted to join the deal on equal terms with Daymond and Mark, but Daymond wasn’t so keen. He told Lori she could make profits from selling Combat Flip Flips on QVC, but she wouldn’t be able to take a share of the equity. Matt, taking a big risk, told Daymond that he thought the company needed a feminine touch. Mark Cuban came back by telling him that in order to accommodate that arrangement, they would have to give up 30% of the business. Kevin O’Leary pointed out that 30% was a lot of equity to give away and asked if they were prepared to lose that much of the company. Matt told him the investment would have to be likewise increased and Kevin suggested he make a counter offer. Matt considered for a moment before coming to a silent agreement with Lee, he suggested a counter offer of $300,000 in exchange for 30%. Mark Cuban agreed, Lori considered for a moment before agreeing, and Daymond sealed the deal without hesitation. After their appearance, the Combat Flip Flip entrepreneurs were overjoyed to have secured a deal with three sharks, who between them had top level experience in branding, distribution and technology. The Combat Flips Flops website is professional, well ordered, full of useful information about delivery times and a good read throughout. It describes the appearance on Shark Tank as a successful mission, and has an impressive update on a few achievements since the show. Since February 2016, the business has managed to place more Afghan girls into school for a year, although in typical modest style for the company, it thanks its customers for the result. It also proudly informs customers that over 2,300 square meters of land mine infested ground has been cleared. True to their boast, Combat Flip Flops really are making the World a safer place. The Website also mentions that demand is at an all time high on all items, but the extensive guides on expected delivery times are laid out with military precision, and no-one will be left wondering how much longer they’ll have to wait for their Flip Flops. Donald Lee and Matt Griffin, making the World a better place, one sale at a time. As for the customer service provided for inquiries, I can attest to its quality. I asked the company how sales were going and they responded well within an hour. 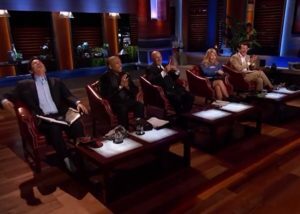 I was glad to hear that sales have gone through the roof since the business appeared on Shark Tank. There has been a 600% increase in demand for Combat products, and that has led to even greater benefits for those in dangerous situations. I was told that since the show, 68 Afghan girls have been placed in secondary school for a year, and over 3,800 square meters of land mines have now been cleared. It’s rare to see a company increasing sales, yet also improving the planet we live on, but Combat Flip Flops are doing just that. Of course, on top of the direct benefits from the increased business, there are also the charitable donations that Combat Flip Flops feed back to the communities that need it the most. The company supports a variety of charities, amongst them are Aid Afghanistan for Education (AAE), a charity that has over 3,000 pupils receiving an education they wouldn’t get otherwise, and the Mines Advisory Group (MAG), that has worked in over 35 countries since 1989, to make former war zones habitable again. However things turn out for Matt and Lee in the long run, and whatever developments their new shark tank partners bring them, they can be proud to have created a company that earns them, as well as thousands of others in need, a living. They are making the World a far better place, one bit at a time. They may be civilians now, but I still salute them both, they deserve it.